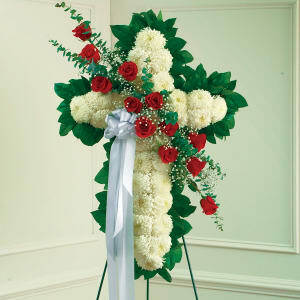 • This standing spray arrangement — in the shape of a cross — is created from fresh white mums, red roses, spiral eucalyptus and more. • Traditionally sent directly to the funeral home by family members or friends and displayed on a stand. • Measures approximately 38"H x 25"L without easel. 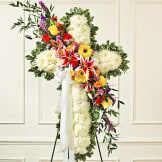 Flowers will be received by a Kjentvet-Smith Funeral Home's staff. 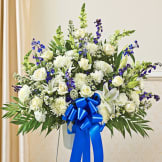 All of our flowers are designed and delivered by hand from a local florist in in Eleva.